Have you heard of or tried the BluePrint Cleanse? The BluePrint Cleanse is a juice fast where you can choose from three different cleanses, renovation, foundation or excavation. Each cleanse features a different of their (I believe) 6 juices. I first found out about it by seeing a blog where she was doing the cleanse (I don’t remember which one). So after doing some research online about the cleanse, it sounded interesting to me. But I was not willing to fork over $65 for 5 bottles of juice (for one day of juicing). Plus, I honestly don’t think I can makes it through a full cleanse, I need some solid food in my life. My grocery store just so happened to have two of the juices ready to grab and go. I went ahead and bought the green juice… for $10 a bottle. It tasted really good, but I just can’t imagine paying that for a week. Even this guy had to do something about the prices. So it was on to recreating these juices at home. My two favorites: the Green Juice and the Spicy Lemonade. This juice is very similar to the recipe I posted here. I know Kale and Parsley doesn’t sound like the most appetizing vegetables to juice, but this juicy is pretty tasty (even Steve approved!). I like to drink this juice with or right after a light dinner. I actually look forward to this juice every day. It’s basically just lemonade with a kick! The lemon is a great antioxidant and the cayenne supports a healthy metabolism. I like to drink this juice everyday usually around 3-4pm as I feel it gives me a little boost of energy and tides me over until dinner time. And since 3 lemons are $1.69 at my grocery store, making this at home saves you a little over $8 a day — cannot beat that! PS – you can now scroll over any image in my posts to pin them to Pinterest! Linking up with Katie and Stephanie for SPD! Hi little lady!!! 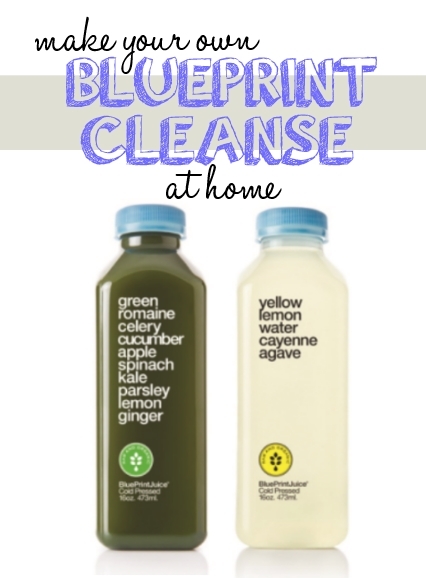 🙂 I had no idea you could make these yourself and I have heard of this cleanse. Good for you! glad you are linking up with us. PS-hope NYC is going well! !